scottleffler.com: Burger Time = Fun! 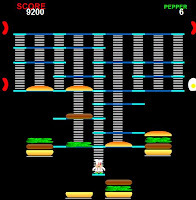 For those who haven't visited the forum ... or who haven't checked out the arcade in the forum, I wanted to let you know, I've been wasting a lot of time playing Burger Time since I added it a few days ago. I'd love to see some friendly competition there. It looks like you have to be a member of the forum to play ... but that's okay, cause the more members we have in the forum, the more games I can add. For every 10 members, I can add another game. Right now, we're at 11 ... so nine more people means another game. Plus, the conversation in the forum is fun, interesting, intelligent ... and best of all, civil. You can contribute to any of the topics or start your own. You don't have to be a member of the forum to read or even to respond to most topics ... but you do have to be a member to read or post in the "members only" section (hence the name).